Writing doesn’t have to be a chore. To prove it, here’s a cause and effect essay example that gets down and dirty with a semi-controversial issue that polarizes a lot of people (no pun intended): yes, we’re talking about climate change. This topic has been in the news for a good long while. There have been movies made about it, conferences held about it, and many works of scholarly and not-so-scholarly literature written about it. So let’s take a look at how to turn this subject into the main topic of a cause and effect essay. We’ll start off with a title, give you the hook, underline the thesis, and highlight some important parts for you to consider. Best of all, we’ll show you how to have fun with your essay. Let’s go! b. Did climate change cause Harvey et al.? c. Is it Really Change? Notice that word at the end of the title? It’s not just made-up word, it’s a goofy-sounding made-up word. But that’s okay! Sure, you might think Dr. Seuss had written it—so why did we use it? Because it’s fun—and it gets to the heart of what this essay is all about: the essay’s main point is that hurricanes are going to hurricane—regardless of whether climate change or global warming are (or are not) occurring. Now look at the first line of the essay below: that’s the hook sentence. Notice what grabs the reader’s attention? That’s right—that’s the name of an Academy Award-winning actress right there. You want a hook? We just gave you one. And that, ladies and gentlemen, is how you lead into an essay. Who said weather papers have to be boring? Jennifer Lawrence and other celebrities caused a jump on social media (as well as traditional media) when they laid the blame for recent hurricanes—Harvey, Irma and Maria—on global warming and climate change. But they weren’t the only ones. The Bay Area in California even went so far as to sue several oil companies operating in the region for their alleged role in making this year’s hurricane season worse than any in recent memory (Slav, 2017). On top of all that, Pope Francis himself condemned climate change skeptics after seeing Hurricane Irma’s destruction (BBC, 2017). The problem with this knee-jerk reaction that one saw across the board, however, is that there is actually little scientific or historical evidence indicating that climate change is caused by anything the oil companies are doing—or that it is even really happening at all. The fact of the matter is that climate change is still very much up for debate. It is an issue that has been highly politicized—and not even for environmental reasons but rather for business purposes (the Paris Agreement is just one example of this: it is easier for larger multinational corporations to crush their competitors by getting governments to pass legislation with which the smaller guys cannot possibly afford to comply). And when one considers that the weather and the complex array of variables that go into forming weather patterns is far more difficult to predict than certain pundits would have an ill-informed public believe, it is not so easy to ascribe weather aberrations to a suspect and highly dubious cause like climate change. First off, what does climate change even mean? Change is, after all, a part of nature—which is not static. So of course climates change. What is implied in the term climate change (typically used in association with global warming) is that mankind is responsible for effecting the change and that the change is unusual, unnatural and very damaging to the planet. This paper will examine each of those claims and show that, as of today, no one has been able to identify a manmade cause of global warming that could possibly cause the type of phenomena so often attributed to it. Okay, let’s pause a minute from the essay. Take a look at the last line of the first paragraph. That’s our thesis. It says plainly exactly what this essay is going to do. (Have a look at this article to learn more about writing a thesis statement). [link to how to write thesis statement article]. Now the rest of the paper is going to have to support that thesis. That means each paragraph should reach back to it and say, see, I’m addressing this part of the thesis! Get back to reading and see how well we did. First, it is important to define terms. What is meant by climate change? What is meant by global warming? Essentially, the two terms are interchangeable because both refer to the process by which pollutants impact the environment in a negative way, which results in more greenhouse gases being trapped in the atmosphere, melting of the ice caps, warming of the oceans, and the loss of all kinds of habitats and life on the planet. The loss of life and property that resulted from Hurricanes Harvey, Irma and Maria in 2017 is viewed by some as the consequence of climate change—and, because people can be quick to place blame before they understand the facts, those who are identified in the media as notorious polluters are called out for being responsible for the loss of life and property that followed in the wakes of Harvey, Irma and Maria. In other words, the usual suspects—Exxon, Chevron, BP, and so on—are called upon to shoulder the blame for Mother Nature doing what Mother Nature does from time to time, which is wreak the occasional havoc upon civilization. To better understand the point, it is helpful to take a look at what causes hurricanes in the first place. Hurricanes feed on warm water. When temperatures are high, sea-water evaporates more rapidly and a storm system can develop over that warm water. This is what happened in the cases of Hurricanes Harvey, Irma and Maria. However, once the hurricanes move out of the warm zone or come into contact with land, they lose some of their force—mainly because their source of energy is depleted—i.e., the warm water regions that are fanning the flames of the storm system’s brute strength. So, yes, warmer waters will make conditions for stronger hurricanes more likely. Weather patterns also play a part in whether a hurricane marches towards the mainland or whether it spirals out to sea—but the point here is that temperature has a lot to do with it. In other words, there is nothing unusual or unnatural about what spawned Hurricanes Harvey, Irma or Maria. That was nature doing what nature does. Moreover, just because “warm” is used to describe the conditions necessary for begetting hurricanes, it does not mean that global warming (in terms of a quickly approaching, fast escalating existential threat to mankind) is here to destroy the earth. One could be excused from thinking such by monitoring social media in the days following the landfall of Hurricane Harvey in Houston or Irma in Florida. Nonetheless, one swallow does not a summer make. Do you know how many tropical storms and hurricanes there were during the Atlantic hurricane season of 1806? 8—including the Great Coastal Hurricane and Hurricane San Vicente. Guess how many there were in 1837 season. 11—including the Antigua-Florida Hurricane, the Calypso Hurricane, the Apalachee Bay Storm, the Bahamas Hurricane and Racer’s Hurricane. In 1886, there were 12 tropical storms and 10 hurricanes—4 of which were major and 7 of which struck the United States (the most in one year ever). A year later, there were 19 tropical storms and 11 hurricanes. And then in 1890? 4 tropical storms and 2 hurricanes—one of which was major. So what does that show? It shows that there are ups and downs in nature—cycles of activity in which there are both extreme and mild conditions. It means nothing more than that there are cycles to nature—just like there are cycles to markets and just like there are cycles to life. How Quickly is Our World Really Changing? Yet the circle of life does not prevent people from making exaggerated claims about the end of the world and about death by climate change. Indeed, some analysts are quick to point out that sea levels are rising—all because ice caps are melting—and that ice caps are melting because the globe is getting hotter—and that the globe is getting hotter because of climate change—aka global warming. The argument is bolstered by the sensational aspect of it all. For instance, the Greenland ice sheet could melt and raise the sea level by 21 and a half feet. The West Antarctica ice sheet could melt and raise the sea level by an additional 26 and a half feet. If the East Antarctica ice sheet melted, sea levels would rise by more than 210 feet (Poore, Williams, Tracey, 2000). In short, virtually every coastal region in the world would disappear—surely a major catastrophe and problem for the whole of mankind since a lot of these regions are responsible for producing large numbers of the planet’s agricultural crops. Still, pointing out what-if scenarios like this does not mean that climate change in terms of the kind of ecological disaster described above is actually happening. Indeed, at the current rate at which the Greenland ice sheet has been measured to be disappearing, it would take, very likely, another 1000 years at least for it to melt (NASA, 2015). The ice sheets in Antarctica would require even more time. And a lot of other factors could change what happens to the world between now and the next millennium—such as the eruption of a super-volcano like the one in Yellowstone (which would in effect cause a nuclear winter that would surely snap any and all ice cap melting in a heartbeat). In short, the ice caps are not melting at a rate that will severely impact this generation or the next or the one after that. It cannot even be determined that the ice caps would stop melting at their current rate were Exxon, Chevron, and every other oil company in the world to pack it up and go out of business tomorrow. (More on that in a moment). The world (including the state of California) would still require energy, and coal would still have to be burned to generate the energy needed to supply everyone’s home with the necessary juice to run the appliances consumers in the modern world so love to buy and turn on. The ire of the public in the aftermath of Harvey, Irma and Maria has less to do with how energy is actually produced and consumed and how the waste products of that process impact the planet than it has to do with people’s own personal and/or ideological preferences for casting blame. It is popular among the PC-generation to abhor the politics of oil and give thumbs up to Elon Musk and the electric car. The same generation seems to forget that most electricity is not produced by “green” methods. In other words, they are participating in the contamination and pollution of the planet by driving their electric cars just as much as someone who drives a non-hybrid pick-up truck is doing—if not more. Yet, that’s not even the kicker. The fact of the matter is that Big Oil is not even really to blame. That’s right—it cannot even be said that the burning of fossil fuels is what causes the most pollution to the atmosphere. What causes the most pollution is actually farm animals—yes, you heard that right: cow “emissions” are more dangerous and toxic to the environment than emissions from tail pipes (Lean, 2006). All the cows in the world, letting gas out, are actually more harmful to the atmosphere than the tail pipes of all the SUVs barreling down American interstates. If you want to blame something for the severity of Harvey, Irma and Maria, you can start by blaming the cows. So why weren’t more people on social media lamenting cow gas in the wake of Hurricane Harvey or blaming the catastrophe in the Virgin Islands caused by Hurricane Irma on heifers in the Midwest or in India? The answer is simple is that because doing so would just be silly. The better answer is that cows as a species have not been politicized in the same manner that the oil industry has been politicized—nor have people been conditioned by the media to resent cows for the pollution they cause to the planet. None of this should be taken as a defense of Big Oil. Surely that industry has a multitude of sins that it will one day have to pay for—but that is not the point of this essay. The point has been to determine whether global warming and climate change are leading to more powerful and destructive hurricanes. So let’s be honest: climate change due to cow emissions is a real thing—cow emissions do impact the atmosphere. Does that mean there is a direct connection between that phenomenon and hurricane formation? No. Nature is much more complex than that. Just ask the good people at HAARP: they’ve been studying the ionosphere for many years now. Indeed, if people are looking to raise an eyebrow or two at the weather, they might want to start by looking at what military scientists are doing in terms of conducting weather modification. Ever heard of Operation Popeye? It was a five-year cloud seeding operation (1967-1972) conducted by the U.S. during the Vietnam War—the aim being to extend the Monsoon season. How did they do it? Silver and lead iodide (United States Senate, 1974). Why did they do it? The objectives of the U.S. were, quite literally, to cause destruction: washed-out roads and crossings, landslides, and over-saturated fields—all to bog down, hurt, hinder and demoralize the enemy. Quite refreshing to know, isn’t it? Now let’s move back to the Atlantic and Hurricanes Harvey, Irma and Maria. Did Big Oil cause them or make them more powerful than they might otherwise have been? What might-have-beens do not make for good science—so, no—and no one has or will be able to prove such a claim. The etiology of a hurricane may be easier to determine than the etiology of Zika—but that doesn’t mean it’s possible to say that SUVs and cow emissions colluded to produce unusually warm waters in 2017 and that those waters colluded with weather patterns to produce strong hurricanes. If people really want to point fingers and blame someone or something, they could at least get creative about it. Indeed, since we live in a world where everything gets politicized, why not ask what motive would someone have to conduct weather modification over the Atlantic? Is there a benefit in wreaking havoc along the Eastern seaboard? Where do the billions of dollars promised in aid by Congress go? Whose pocket gets to receive those Federal Reserve notes? Perhaps the weather modifiers thought it would be a good way to jumpstart certain sectors of the economy. Or perhaps asking such questions is as unfair as saying that this year’s hurricanes were stronger and more powerful than last year’s because of fuel emissions—or cow emissions—or whatever it is that people claim is causing climate change to be the harbinger of doom that it so wants to be. The fact is: climate change is a part of nature—it’s a part of history—it’s a part of life (Bell, 2012). The world is always changing—and just as the seasons come and go and come again, so too does the weather move in patterns, swirling in a cycle from mild to extreme to mild again. We do not see hurricanes like Harvey, Irma and Maria every year—but if the claims about man-made climate change were true, we very certainly would—and they would get worse and worse and worse. If you like, tune in next year to see whether that has been the case. This cause and effect essay example should show you how to take a topic, examine it, turn it around and around, and make a judgment on its inputs and outputs. It starts off with a hook, moves to the thesis, builds on the main point by supplying a solid body that supports the thesis, and closes out with a good conclusion. 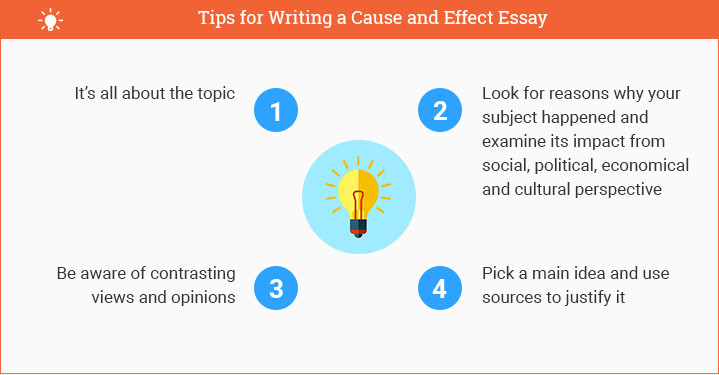 If you’d like more information on how to write a cause and effect essay, take a look at this article. It’ll give you a lot of helpful hints that will definitely spruce up your writing. If you’d like to see other cause and effect essay topics, take a look at these. Or if you just need some help writing any old kind of research paper, look no further. We’ve got you covered. Stay strong, keep writing, and keep tuning in for further essay-penning answers to your essay-penning questions. See you next time! Make your essay fun: if you’re not having fun, why are you writing? Use that hook to get your reader interested. Don’t forget to tie it all back in to your thesis. Support your thesis with good points throughout the body of your essay. "Cause and Effect Essay Example: Climate Change & Hurricanes." Aceyourpaper.com. Student Network Resources Inc, 29 September. 2017. Web. 19 April 2019. Student Network Resources Inc. "Cause and Effect Essay Example: Climate Change & Hurricanes." Aceyourpaper.com. https://www.aceyourpaper.com/essay/cause-and-effect-essay-example/ (accessed April 19, 2019).